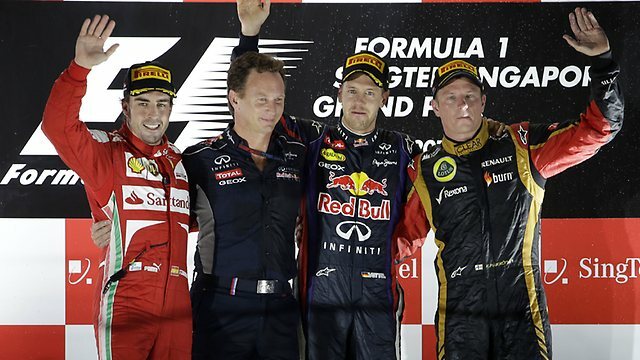 Who can win the F1 title and how can they do it? Possible permutations for the 2012 Championship. 1. Finish in the top four. 2. Finish fifth, sixth or seventh but Alonso must finish second or lower. 3. Finish eighth or ninth, but Alonso must finish third or lower. 4. Finish 10th or lower but Alonso must not make it onto the podium. 1. He must win the race and Vettel must go on to finish fifth or lower. 2. He must finish in second and Vettel must go on to finish eighth or lower. 3. He must finish in third and Vettel must go on to finish 10th or lower. Circuit of The Americas today announced that it has been declared ready to host the 2012 F1 United States GP by Charlie Whiting, who directs racing, safety and technical matters for the FIA. Whiting visited the Central Texas racing circuit as part of a scheduled pre-race inspection and approved the circuit for “Grade 1” status, hence appropriate to host an F1 race. Whiting’s visit comes approximately two months before Formula 1 racing is set to return to the United States, Nov. 16-18. He spent approximately two hours touring the Austin facility along with representatives of Circuit of The Americas, general contractor Austin Commercial and German track architects Tilke GmbH. Whiting had rave reviews for the entire venue and the work completed since his last visit to the circuit in August 2012. During his visit, Whiting inspected the now fully paved racing circuit and personally walked the 3.4-mile course to ensure the asphalt met FIA requirements. He inspected kerbing, guard rails, fencing and other safety measures that have been installed around the circuit. He also toured the pit/paddock building, which will house Race Control and serve as his base of operations during the Formula 1™ event. Whiting described the circuit’s permanent structures as “fantastic,” and said he was especially impressed with the design of the circuit’s turns, including its signature Turn 1. “There are 3-4 corners that are very likely to see overtaking,” Whiting remarked. “If you look at Turn 1, you’ll see that the turns have been designed so that they’re extremely wide and the apex is very short. It’s a very modern approach to slow corners where we hope overtaking will take place. So I’m very confident it will work well. Whiting said he was assured that remaining landscaping and painting projects will be completed in a few weeks’ time. He will conduct one final check of the venue on Monday, Nov. 12, as Grand Prix week in Austin gets underway. 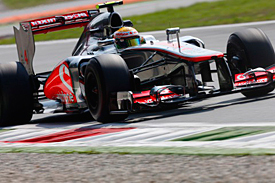 Lewis Hamilton claimed his fourth pole position of the 2012 Formula 1 season as he led Jenson Button in an all-McLaren front row in qualifying for the Italian Grand Prix. Having led both second and third practice, Hamilton maintained his strong form to set a 1m24.010s at the start of Q3. That proved unbeatable, and Button eventually joined him up front with a lap 0.123 seconds slower. Button’s run deposed Felipe Massa, as the Ferrari driver delivered his best qualifying performance of the year. 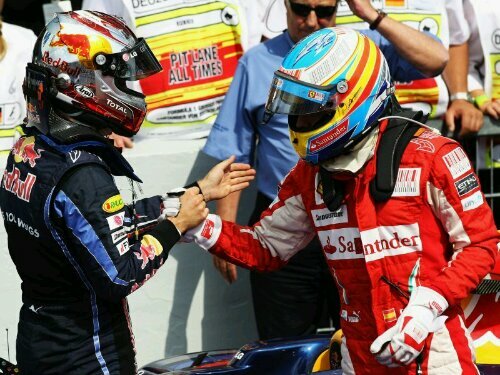 But it was a disastrous session for Massa’s championship-leading team-mate Fernando Alonso, who was only 10th, 1.4s slower. Ferrari reported a suspected anti-rollbar failure. Paul di Resta qualified a superb fourth, although he will move down to ninth when a gearbox-change penalty is applied. The Scot’s speed will still be some consolation for Force India as his team-mate Nico Hulkenberg encountered an apparent gearbox problem at the start of Q1 and was left at the back of the field. Red Bull had another muted qualifying session. Sebastian Vettel was sixth, while his team-mate Mark Webber did not make Q3, missing the cut by 0.067s as he took 11th. Mercedes’ Michael Schumacher and Nico Rosberg sandwich Vettel in fifth and seventh. Kimi Raikkonen qualified eighth for Lotus, ahead of Kamui Kobayashi’s Sauber. It was also a tough day for Williams. A mistake on the exit of the Ascaris left Pastor Maldonado 12th in Q2, which will become 22nd on the grid due to his Spa penalties. Bruno Senna was only 14th in the sister car. Romain Grosjean’s substitute Jerome d’Ambrosio was around 0.7s off team-mate Raikkonen’s pace throughout qualifying, which left him 16th for his Lotus debut. D’Ambrosio substitute had a brief scare in Q1 when an error on his first run left him behind Heikki Kovalainen’s Caterham and in danger of elimination, but he switched to the softer tyres and made the cut with his last attempt.